Today, I stumbled on a bunch of gnolls attacking some stranger-drow by the name of Drizzt. I do not know why, but I just let them murder the hapless sod. I hope, he does not mind. @SirBatince You are correct, good Sir. @sarevok57 Not a tiny bit. Also, I'd love those sweet, sweet 12K XP of his, since I am doing no-cap solo, but alas, I don't want to bother my self with consequences of such an act. Besides, gnolls are doing quite well on their own. They make the game a lot easier, for most parties, and why not? @Dharius Exactly my point. Why not? 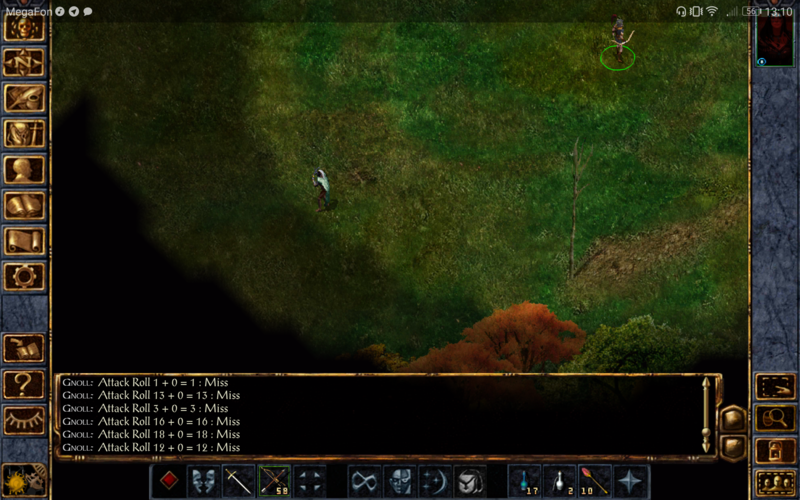 Position party members around Drizzt => remove them from the party => Drizzt surrounded by friendlies => use 2-handed reach weapon to hit him to death, while Drizzt can't reach you. Benefit is a bucketload of XP, but a big penalty on reputation. I think I prefer the Gnoll option, plenty of Xp in the game to reach the XP cap anyway.